Americans love coffee, so much that 34% of women and 14% of men name espresso, cappuccinos, or lattes their coffee beverage of choice according to a 2015 Zagat survey. But at an average price of $3.28 at the coffee shop, your daily coffee habit could be costing you $1,200 or more per year. Just pull your own shot at home, right? No matter your budget, there’s a home espresso machine that checks all of your boxes. Find the best model for you with this comprehensive guide as well evaluate 20 different models to help you find the best espresso machine for you. To help keep things organized we’ll break these 20 machines up into 4 different tiers from super-automatic machines to bargain basement models. These are the 5 best super-automatic espresso machines that won’t break your wallet. Click on each model to jump to its section. 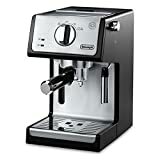 The extra small (XS), compact version of the DeLonghi Magnifica espresso machine line, the ECAM2210B falls just behind the next-step-up ECAM2310B but packs a ton of value. My favorite feature of the Magnifica XS ECAM22110B is how intuitive its user display is. For the most part, all of these Tier 1 super-automatic espresso machines do the same stuff — that’s what classifies them as super-automatic espresso machines! But the DeLonghi Magnifica’s rotating knob allows you to easily cycle through all of the programmable functions the ECAM22110B offers. My least favorite feature about the Magnifica XS ECAM22110B? You can’t adjust the water volume with each brew type (e.g. espresso or long coffee). If you’ve used (and loved) DeLonghi machines in the past and really value the extra year under warranty, go for the DeLonghi XS ECAM22110B. If you want the flexibility to program your brew size, you’ll want something else. Saeco is a great brand with high-quality products, and I doubt you’ll be disappointed owning one of their premium super-automatic models. What do I love about this machine? The LCD screen is a great feature. You also get the water hardness setting unique to the Saecos on this list. The compact brew group is also removable for easy cleaning. On the downside, this machine is not made with stainless steel. Instead it has a plastic exterior. Aside from the couple other cons noted below, there aren’t many negatives I have to say about this machine. I’m a big fan of Saeco — their extended brew group warranty is especially great — and I’d recommend almost any Saeco espresso machine. This middle-of-the-road Saeco super-automatic espresso machine is intended for those looking for something better than a $500 machine. If you’re willing to extend your price range a little, you can get a superior machine in the Saeco Incanto. I’d suggest you read our full Gaggia Anima Prestige review. In this space we’ll give you the tl;dr.
I’m a big fan of Gaggia and really like their products. They aren’t as good as Saeco espresso machines, but they deliver good bang for your buck. The Anima Prestige delivers compact performance with an incredibly easy-to-understand, intuitive user interface. You can program just about everything at the push of a button, including extraction temperature, and get a true one-touch espresso or specialty beverage. Of course, trying to be a little budget conscious here means something’s gotta give, and with the Anima Prestige that something is it’s all-plastic exterior. I wouldn’t say this model feels cheap, but at 16 lbs it’s definitely the lightest Tier 1 model on our list of best super-automatic espresso machines. And a minor annoyance: I love the Gaggia Anima Prestige’s automatic cleaning cycle, but you only have a 10 second window during which to initiate it. I don’t know about you, but I’m somewhat scatterbrained. Sometimes the smell of my perfectly extracted shot distracts me from activating the cleaning mode! Overall, the Gaggia Anima Prestige packs a ton of functionality and a high-quality espresso into a compact and affordable machine. If you don’t mind the cheaper all-plastic feel, you’ll really enjoy the Anima Prestige’s awesome functionality. This is arguably DeLonghi’s low-end super-automatic espresso machine, but it could be a great value depending on your price range. The Magnifica ESAM3300 does everything it should with great consistency. The resulting espresso was awesome for the price range, and I do like the larger water reservoir and adjustable exit nozzle. My biggest problem is that these machines can be a little unreliable. While my few weeks of use didn’t turn up any significant flaws, some long-time users have reported issues with the grinder or spent puck drawer malfunctioning after 9-12 months of use. You do get the benefit of DeLonghi’s 2 year warranty, but sending the machine in for repairs is an additional expense and takes time. That’s time you don’t have your espresso machine! But in the end, a super-automatic espresso machine is very much a “you get what you pay for” item. If you want to watch your wallet a little, I think you’d be better served buying the 2nd-ranked Gaggia Anima. If you love DeLonghi but aren’t looking to spend towards to top-end of your potential price range, take a look at the Magnifica ESAM3300. Matched up head-to-head with most of the other machines on this list, the Gaggia Brera comes up short. But the Gaggia Brera has one major advantage: its price tag. Everything else in Tier 1 tends to stretch your wallet a little further. The Gaggia Brera is alittle kinder. In my use the Brera was a very capable machine, but swapping out stainless steel for plastic is a concern. Still, a lot of Brera users report their machines lasting several years. 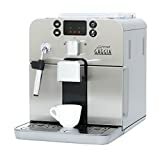 Ultimately the Brera has everything you’d expect a super-automatic espresso machine to have, including a very intuitive user interface that allows you to easily refine your espresso to your tastes. But objectively it isn’t the best super-automatic espresso machine listed. If your price range can stretch further I’d be inclined to go with one of the other machines on this list. But if you’re intrigued by the prospect of living with something more budget friendly, the Gaggia Brera is your best bet. Maybe you don’t want a super-automatic espresso machine. Maybe they’re too rich for your blood, or maybe you like a little bit more involvement with your daily shot — I know I do. 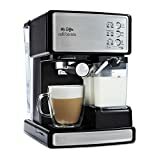 If that’s the case, these semi-automatic espresso machines are great,especially for intermediate level home baristas who have a little extra cash to spend. 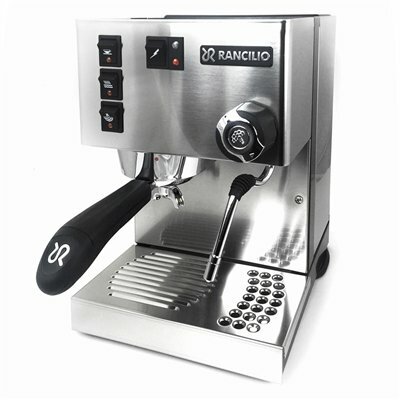 The Rancilio Silvia may the best espresso machine on this list, regardless of tier! I know it’s certainly my favorite. It just falls out of Tier 1 because it isn’t a super-automatic model. But super-automatic isn’t always better. You’ll still need a good dedicated grinder to grind your own fresh coffee beans in order to make the most of a machine like the Rancilio Silvia, but in my opinion a good grinder is just the cost of admission when making espresso at home. The Silvia’s massive 67 oz water reservoir feeds a 12 oz chrome-plated boiler, which is used for both pulling the shot and steaming your milk. The small boiler size offers extremely fast recovery from shot to shot, meaning you can pound out an entire dinner party’s worth of espresso in just a few minutes. And take a look at the Key Features section below. Look at this things size and weight. It’s packing a ton of heft into a smal package. That’s because the Silvia is durable and made to last. Its brew group is commercial quality, so you’ll be pulling professional shots. With practice, you’ll probably be better than your local coffee shop! Maybe you could charge for your espresso to offset the price? I dunno, just thinking out loud. Someone looking for the best espresso machine available (for a reasonable price, that is) and doesn’t want one of the super-automatic models in Tier 1. DeLonghi is a quality brand that makes seemingly millions of different models of espresso machines. While the DeLonghi EC702’s espresso falls short of the aforementioned Rancilio Silvia, this model is a little more foolproof — especially with its Pannarello steam wand. Just pour in your milk and press the “Steam” button. Done. The foam’s quality is B+ — sometimes you get some larger bubbles — but that’s to be expected with a fully-automatic frothing system. If you want more control over your foam, remove the black tip on the steam wand and manually froth yourself. 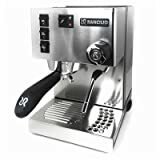 Like all models on this list, the EC702 only comes with pressurized portafilters, and it’s E.S.E. soft pod compatible. What I really love about this machine is its strong, sturdy build. It’s not 100% stainless steel — that would jack the price tag up — but DeLonghi does work a good amount of stainless steel paneling into their design. That makes this model both easy to clean and visually appealing. I’d still go with the Rancilio Silvia, but that model has much more of a learning curve. The DeLonghi EC702 is much easier to use and affords the one-button frothing feature, which will definitely appeal to some users. 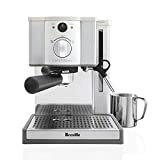 The best quality of the Breville ESP8XL Cafe Roma espresso machine is its durability. If you read reviews for this model on Amazon, you’ll see a lot of users who report this machine lasting 3+ years. That’s pretty great! This model has a lot of stainless steel components, even on the inside of the machine, to keep it functioning well for years. Though almost all of the machines on this list are stripped down to the essential features — that’s how they keep their price tag low — the Breville ESP8XL really takes that to heart. This unit is smaller and more compact than many pump espresso machines. The downside of this machine, though, is the 40 oz water reservoir, which pales in comparison to Tier 2’s top-ranked Rancilio Silvia’s 67 oz tank. For those who want something small and simple yet well-built and reliable. This machine is the best pound-for-pound build quality of any on this list. Incredibly simple and very affordable with some nifty features, the Capresso Ultima PRO is an intriguing espresso machine for those looking for something with more than just the bare bones espresso-making essentials. Nifty features aside, this model pulls a strong shot with a rich crema. The problem is that some users (not an insignificant amount of them) have reported pump failures around 4-5 months of use. I have used this machine. I was impressed with it, but I did not experience a pump failure. However, because of that risk I had to move it down to 4th in Tier 2. As mentioned above, an interesting feature of this model is its built-in tamper. When you insert the portafilter basket, the machine automatically tamps the grounds for you. This can be construed as either a pro or a con depending on your preferences. Some people like myself enjoy being able to tamp their own grounds. It affords a little extra control over my shot. Others enjoy having this extra step being hands off. I listed this feature as a pro in the table below because generally speaking people shopping in this price range like simpler shots with fewer steps. Your mileage may vary. Those who appreciate the self-tamping and programmable shot size functionality and don’t mind the small water reservoir. Alternately, this machine is also for the risk takers among us. At its best, the Capresso Ultima PRO might be the 2nd-best espresso machine in this Tier. However, you could be one of the unlucky ones who experiences a pump failure early in the machine’s life. You are protected for 1 year, but outside that you’re on your own. Immediately the DeLonghi DEDICA stands out from other espresso machines on this list. You can set the machine to brew low, medium, or high temperature shots, but let’s be real. You’re going to choose high. You can set your water hardness to soft, medium, or hard to get a customized reminder of how frequently you need to descale the machine. That’s nice and all, but just descale every 2-3 months or more frequently if you have hard water. You can set the auto-off mode to turn off between 9 minutes and 3 hours, depending on how you plan to use the machine. You can customize your shot size by pressing and holding either shot button, which can either be great (if you want to permanently change the volume) or annoying (if you’d like it to go back to the original volume). I side with it being a great feature. Those features aside, this is your standard pump espresso machine. It brews single and double shots and is E.S.E. pod compatible, and despite its sleek design there’s a milk frothing attachment on the right side of the machine. How does the DeLonghi DEDICA perform? Frankly, it pulls a very good shot. No complaints there. Issues sometimes arise with the frother. Sometimes you can make very thick, hot frothed milk. Sometimes it runs out of steam and doesn’t maintain the proper temperature. My only other complaint is more me being picky than anything, but I wish the machine had more weight to it. I know it’s designed to be small, but espresso machines should have some heft to them to prevent the unit from moving around as you lock in or remove the portafilter. Additionally, like the Capresso Ultima PRO above, there have been some reported pump failures. Those without much counter space who need the sleek design and who like the extra programmability. Cheap. Bargain. Discount. Call them whatever you like. These Tier 3 machines will give you a decent shot, but you’ll have to sacrifice a little quality for the sake of your budget. These are the 5 Tier 3 models. Click each one to jump to the appropriate section. When I think of Mr. Coffee the first things that come to mind are cheap, low quality coffee makers. With their Cafe Barista Espresso Machine, cheap still applies — but it isn’t low quality. Plus, the built-in automatic frother takes the guesswork out of specialty beverages but allows you to manually froth if that’s your thing. The only real drawback with the frother is it doesn’t quite get to the bottom of the frothing pitcher, consistently leaving you with an inch of wasted milk. Take care to clean the frother regularly, at least every few weeks, or it’ll stop performing. Spoiler: The fourth-ranked espresso machine in Tier 3 the DeLonghi ECP3420, which is very similar to the Mr. Coffee Cafe Barista. Like the DeLonghi ECP3420 below, this pump espresso machine is E.S.E. pod compatible. But unlike the DeLonghi ECP3420, the Mr. Coffee Cafe Barista does come with a tamper and frothing pitcher, and the tamper doubles as a measuring scoop. 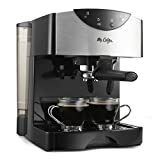 The included 55 oz water reservoir is pretty large and compares favorably to every other bargain espresso machine on this list except the DeLonghi Esperta 2. The Mr. Coffee Cafe Barista ECMP1000 Espresso Machine has an impressive combination of functionality and affordability and takes down the top spot as the best espresso machine in Tier 3. Not the size you’re looking for? No problem. The Nespresso Pixie has what might be the simplest programmable brew size selector in the single serve coffee game. The Nespresso Pixie will remember that size until you change it. Nespresso advertises this espresso machine has up to 19 bars of pressure, which technically is true, but it’s a little misleading. First, you don’t need 19 bars of pressure to make a great espresso. You need half that. Second, it’s an inconsistent 19 bars of pressure, fluctuating throughout the extraction process. Still, the Nespresso Pixie produces a surprisingly great espresso complete with a rich, thick crema. I go into much more detail in our Nespresso Pixie review, so give that a read if you’re considering this awesome machine. The Nespresso Pixie isn’t a true espresso machine, but it pulls a great shot with almost zero effort. Sure, it’s a little noisy, but does that outweigh the Pixie’s easy one-touch brewing, simple custom brew size selector and high-quality Swiss build? I love this espresso machine and believe it’s one of the few kitchen appliances that’s actually worth its price tag. 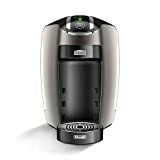 Made by DeLonghi as part of Nescafe’s Dolce Gusto line, the Esperta 2 is a capsule-based espresso espresso machine which brews 1.2 oz ristretto espresso beverages, 12 oz coffees and 6 sizes in the middle. It also allows you to select hot or cold, brewing a wide range of drinks from standard espresso to both hot and iced cappuccino. You don’t need a frother to make your foam-based beverages. Instead, the Esperta 2 uses milk pods designed for that purpose. The DeLonghi Esperta 2 User Manual does a great job explaining how to use this espresso machine and includes a lot of clear, colorful pictures. I highly suggest reading through it before purchasing. VERSATILITY - Brew both Hot AND Iced Beverages with a push of a button. Use our iced-compatible capsules to make iced cappuccinos and teas at home! The DeLonghi Esperta 2 isn’t quite as good as the Nespresso Pixie, but it’s not far behind. I love this machine’s quality — both in build and beverage — and the flexibility to brew hot and cold beverages of various sizes makes it a versatile purchase. Another product in the Nescafe Dolce Gusto line produced by DeLonghi, the Genio 2 is very similar to the Esperta 2. Ultimately the Esperta 2 gets the nod because it’s slightly more advanced and has a larger water reservoir, but deep down the two DeLonghi-built machines are almost identical. Craft - enjoy 20+ different coffeehouse drinks in the comfort of your own home, including premium roast coffees, espressos, macchiato, lattes, Iced drinks and more! The DeLonghi Genio 2 is the Esperta 2’s baby brother (or sister?). If you’re looking to save a few bucks or want a more compact version of our second-ranked bargain espresso machine, go with the Genio 2. The DeLonghi ECP3420 kicks the capsules to the curb and goes with good ol’ fashioned coffee grounds. The DeLonghi ECP3420 pressurized portafilter comes with an attachment making it compatible with espresso pods. Not Nescafe or Nespresso pods mind you, but rather the E.S.E. soft pods available by companies like Lavazza. These are the ones. The pressurized portafilter is great for novices as it helps ensure optimal pressure for a rich creme, even when using the E.S.E. pods. The departure from a capsule system necessitates the use of a real frother for cappuccinos, lattes and other specialty beverages, and the DeLonghi ECP3420 comes with one built-in. More complicated than capsule-based foam? Sure. Add in the stainless steel plated exterior and internal boiler plate, the ability to brew two espresso shots at once and the stainless steel plated exterior and boiler plate (did I say that twice?) and you get a pretty nice machine for an appealing price. Second, the frother sometimes fails to froth. It got my milk nice and hot, but sometimes the foam wasn’t as foamy as I’d like. If you’re looking for an entry-level pump espresso machine, consider the DeLonghi 3420. It definitely has its limitations — most notably the water reservoir that doesn’t want to stay put and the frother that sometimes doesn’t want to froth. Overall, the EC3420 makes great tasting espresso for a great price. If price range is more important than quality, you might love one of these Tier 4 espresso machines. Easy to use, great shots at this price point, fantastic frother, and easy to clean. I love how compact it is — especially with my limited countertop space — but that compact convenience comes with a cost: you can only fit small demitasse cups under the spout (up to about 2.5″ tall). But with more basic espresso machines, you know there are going to be some drawbacks. You won’t get the all-in-one convenience of the Jura ENA Micro 9 or the complete control afforded by the Breville BES870XL. Still, the DeLonghi EC155 makes quality espresso for its admittedly bargain basement price point. With the foamiest frother on this list, the DeLonghi EC155 is ideal for anyone who wants an affordable latte or cappuccino machine. A close second in Tier 4 to the DeLonghi EC155, the Mr. Coffee ECMP50 is a standout espresso machine in the discount category. In the end, the Mr. Coffee ECMP50 easily cracks the top five best espresso machines under $100 and is closer to the top-ranked DeLonghi than it is to our third-ranked espresso machine. If you’re looking for the best bargain espresso shot, the Mr. Coffee ECMP50 is for you. It pulls a slightly better shot with richer crema than the DeLonghi EC155, but its frother isn’t quite as good as the EC155’s. Let’s get this straight: the Bialetti Moka Express is not a true espresso machine. It doesn’t have a pump and thus doesn’t reach the requisite 9 bars of pressure for legitimate espresso. Instead, it leverages the power of thermodynamics to create an espresso-like concentrate. It’s a three-chamber system — bottom water chamber, middle ground coffee chamber, top coffee-collecting chamber — that uses steam pressure to force water through coffee grounds to make your coffee. Pros and cons are detailed below, but a Bialetti is great for those who want to make rich coffee at an affordable price possibly for a decade. No pumps, no heating elements, no plastic tubing or electrical cords. Just good ol’ fashioned aluminum components with the patented Bialetti design to consistently make great espresso-like concentrate after great espresso-like concentrate. With such a raving review, why does this only check in at #3? Again, it isn’t true espresso. It’s not for espresso connoisseurs — those folks will be upset that this doesn’t make true espresso. 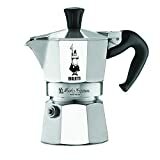 But if you want rich, concentrated coffee for a super cheap price with a longer lifespan than the other models listed, the Bialetti Moka Pot is your best bet. Also comes in 6 different colors! Hamilton Beach struggles to keep pace with top-end coffee and espresso machines — those that go for $1,000 or more. But discount kitchen equipment is their sweet spot. How most espresso machines work: Insert the portafilter and twist to lock it in. How the Hamilton Beach 40792 works: Slide the portafilter straight back (horizontally) into a slightly descended holder, then grasp and push up on a lever on the left-hand side of the machine to lock it in. At first I didn’t like this newfangled doodad, but then it started to grow on me. I’m sure I’m not the only person whose had to struggle with dislodging the portafilter from an espresso machine. That’s not an issue with this model. If you enjoy the (more than occasional) latte or cappuccino, you’re better served with our #1 or #2 espresso machines on this list. But the Hamilton Beach 40792 scores points for pulling a quality shot, and I really do like its durable, no-fuss, not-gonna-break-on-you lock-in-lever system. At least, that’s what I’ve heard the MiniPresso referred to as (on more than one occasion). 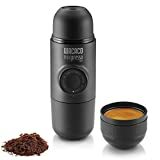 Completely hand-powered, compact and portable, the MiniPresso is a fantastic option for those on the go. It’s perfect for frequent travelers (fits in your carry-on), road trippers, campers, and even the office. You can even use the screw-on top as an on-demand demitasse cup. Dollar for dollar, you’ll get better bang for your buck with the other espresso machines in Tier 4. But literal pound for pound, nothing else here tops what the MiniPresso GR produces. Hand-pump powered — no batteries or electricity necessary! Anyone who wants on-demand espresso on the go, especially if you’re a frequent camper.